Birders have long known that the beautiful canyons north of Ellensburg are productive birding sites. Colockum Road is one of the most accessible by road - and one of the most spectacular. These canyons drain the eastern flanks of the Wenatchee Mountains. A drive up Colockum Road is a journey through the major life zones of the East Cascades. Colockum Road begins in the irrigated fields of the Kittitas Valley, climbs through shrub-steppe into the Ponderosa pine zone, and finally to high-elevation mixed conifer forest (Douglas fir, western larch, subalpine fir). In some areas, a patchwork of mixed-age conifer stands results from selective logging by the state. The lower elevations are dry, particularly in summer, but the high elevations may remain blanketed in snow until well into summer. Spectacular wildflowers are found everywhere. 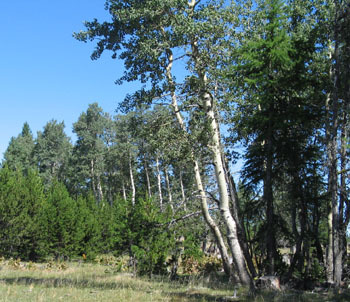 Aspen groves thrive in moist areas. On the north side of the divide at Colockum Pass, the road descends along Colockum Creek to the Columbia River, with awe-inspiring views along the way. In the shrub-steppe areas, look for Brewer's Sparrows, Western Meadowlarks, and Sage Thrashers. Lazuli Buntings are found on shrubby hillsides. In the Ponderosa pine zone, Gray and Dusky Flycatchers, Western Wood-Pewees, and Chipping Sparrows can be found. In the higher-elevation mixed coniferous forest, Red and White-breasted Nuthatches, Hairy Woodpeckers, Cassin's Vireos, Western Tanagers, Golden-crowned Kinglets, Yellow-rumped Warblers, and Mountain Chickadees are seen. Check aspen groves for nesting Williamson's Sapsuckers, Hairy Woodpeckers, Red-naped Sapsuckers, House Wrens, and Warbling Vireos. At dusk, Common Poorwills can be heard calling, and Common Nighthawks often fly overhead. Flammulated Owls inhabit the hillsides and ridges in summer. Summer and early fall are the only times when the high-elevation portions of the road are open. The road is rough, but can be navigated with a two-wheel-drive vehicle, though four-wheel-drive and/or high clearance are helpful. From I-90, take Exit #115, go north through Kittitas to a "T." Go right on Patrick Avenue and then left on Road No 81. After about four miles, turn right at another "T" onto Brick Mill Road (Erickson Road). Go about two miles to Colockum Road. Turn left and proceed slowly up into the canyon, stopping to bird the different habitats. When the grade moderates at high elevation (passing along a power-line corridor), watch for a three-way intersection (about 11 miles from the start of Colockum Road). Go left over Colockum Pass and eventually down to the Columbia River. Weather conditions and logging activity can affect road conditions. Elk and deer hunters will be in this area in the fall. There are many de facto campsites.